To Madame Joan Guriras, the children Dantago, Hagane and the rest of the family of the late Theo-Ben Gurirab and to the entire SWAPO Party. I am truly saddened, as I join the rest of the world in mourning the passing of Cde Gurirab, a true hero of the Namibian liberation struggle and stalwart of Swapo. 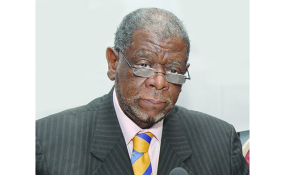 As Namibians we must be consoled by the dedicated work of the late Gurirab, because his struggle was our struggle and his triumph was our triumph. Eventually, Namibia gaining independence, peace, democracy and our quest to achieving prosperity for all is and will always be part of the legacy of the late Cde Gurirab. When the news of his passing came in, I could not believe it. Because it was just on 5 June 2018 that we were sitting with this great giant in the Swapo politburo meeting. From the moment he walked in the meeting, there was some kind of aura around him. As he walked in, Dr Hage Geingob, the president of the republic and of the Swapo Party, applauded him and other stalwarts for being committed to the work of Swapo, like attending politburo meetings and other party activities. Today, as the news of his passing is travelling across the Namibian nation and the world over, I am overcame with a lot of emotions as I travel back in time, to the era of the liberation struggle when we were refugees living in the camps in Angola and later on in Congo. It was Swapo stalwarts such as the late Cde Gurirab who inspired us to stay strong whenever they visited the Swapo camps deep in the mountainous bushes. Eventually, he continued to provide me with encouragements, advices and wisdom when he was prime minister too. Ironically, the late Cde Gurirab will always say whenever another hero had fallen that "we do not mourn heroes, but we celebrate the life they lived". Gurirab's life has always been about commitment, dedication and giving. His life and sacrifices should remind us of the much work that still need to be done in order for Namibia to realise our developmental objectives. He stood unwavering through the test of time to see that freedom and justice were achieved. I would like to pay my homage to this liberator who together with many others weathered the storms in foreign lands to fight for the liberation of Namibia. I would like to encourage the Namibian youth that more work still needs to be done in order to consolidate the gains of our independence. Issues like lands redistribution, first class education system, proper housing for all and economic empowerment still need to be perfected in order for our people to benefit. So being part of the current Swapo leadership, we will continue to foster economic policies and implementation strategies that will improve the socio-economic emancipation of our people. Rest in peace my dear Comrade Senior. * Dr Tobie Ocean Aupindi is a member of the political bureau of the central committee of the ruling Swapo Party. Namibia: Presidential Immunity - Is the President of Namibia Above the Law?